Mega Sale! 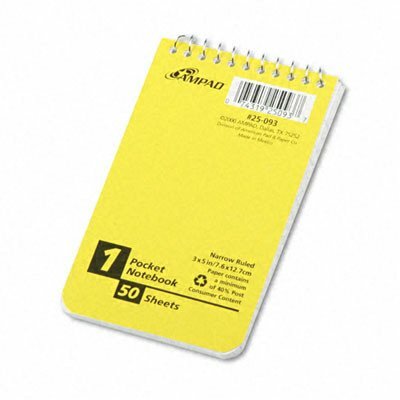 Save 27% on the Recycled Memo Books in White [Set of 4] Size: 3'' W x 5'' D by Ampad at LDP Graphic Design. MPN: TOP25093. Hurry! Limited time offer. Offer valid only while supplies last. TOP25093 Size: 3'' W x 5'' D Features: -Book. -Fits perfectly inside jacket, pocket or purse. -Ruling: Narrow. -Sheets per pad: 50. -Color: Assorted. TOP25093 Size: 3" W x 5" D Features: -Book. -Fits perfectly inside jacket, pocket or purse. -Ruling: Narrow. -Sheets per pad: 50. -Color: Assorted. Product Type: -Exam Book. Subjects: -3-Subject. Rule: -Narrow. Size: -3" X 5". Sheet Count: -50. Dimensions: Size 3" W x 5" D - Overall Height - Top to Bottom: -3". Size 3" W x 5" D - Overall Width - Side to Side: -5". Size 5" W x 3" D - Overall Height - Top to Bottom: -5". Size 5" W x 3" D - Overall Width - Side to Side: -3".